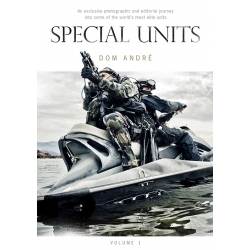 For the first time, he presents 28 of these special units through 500 photos in a single book: PI2G (France), DPR (Switzerland), GIGG (Switzerland), RAID (France), GPI Guadeloupe (France), GIPN (France), Commando Hubert (France), STAR (Singapore), DSU (Belgium), Las Vegas Metro PD SWAT (USA), Las Vegas Metro PD Search & Rescue (USA), CORE (Brazil), Col Moschin (Italy), Vancouver ERT (Canada), TEK (Hungary), LASD SEB (USA), BSIJ (Romania), GRUMEC (Brazil), Monte Cervino (Italy), ZJ (Czech Republic), US Marshals SOG (USA), SFG (Belgium), COBRA (Austria), BORTAC (USA), ATF SRT (USA), NOCS (Italy), RCMP ERT (Canada), EULEX IG (European Union). In this book you can learn about the very closed world of operational units: you will fly over the Grand Canyon in a helicopter, patrol the favelas in Rio, dive with combat frogmen and smell the powder of explosions. But more especially, you will discover these very unusual men who are ready to put their lives in danger in order to save yours and those of your nearest and dearest.